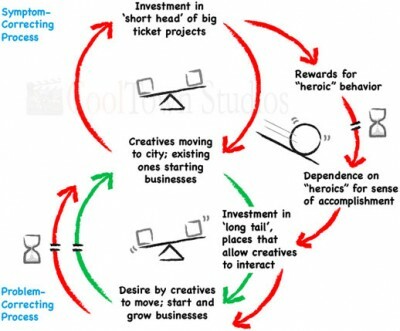 Utilizing the Fifth Discipline principles of systems thinking, we bring to you a representation of why cities, especially their economic development departments that manage the largest of budgets, choose to invest in the outdated practice of landing ‘the big one’ rather than cultivating its own creative economy that is known to create jobs more effectively. The Context: First of all, it’s important to understand the long tail. The vertical axis in the graph to the left is economic output, the horizontal axis is size of company. The ‘big head’ (red) represents the big ticket entities (ie Fortune 1000 companies) that cities often spend most of their budget on to secure (which dooms a country since it’s a zero sum gain), while the ‘long tail’ (orange) represents all the rest; the small businesses. Notice how the total area in orange exceeds that in red. 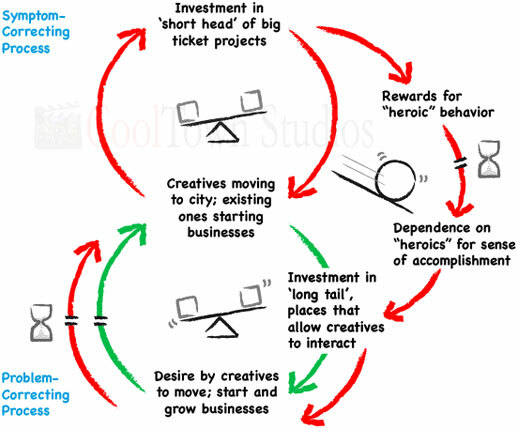 The Result: The declining industrial economy model of economic development is represented by the loop on the top, contrasted with the creative economy loop at the bottom. Red arrows show a negative effect, green arrows are positive. The balanced icons signify a static situation, while the snowball icon symbolizes an escalating situation for better or worse. Notice how investment in the ‘big head’ leads to occasional success, which gives the false impression that there’s no other way. This takes investment away from places and programs that attract the creatives, which spur economic growth. Unfortunately, this requires time (represented by the hour glass) to recognize the windfall while landing a large company is immediate, thus the slow addiction to investing more $ in stealing other people’s companies rather than economic gardening one’s own.